All costs of the project, including those associated with acquiring the easements, would have to be born by PHG, though the county is reserving the right to upgrade the size of the sewer line if PHG builds it and to cover the costs of the upgrade. PHG last night asked the Planning Commission to postpone consideration of its rezone and related special use request without giving any indication that the costs and complexity of building the sewer line played any role. The Commission granted the request. One person with knowledge of the discussions told me that the sewer line played a major role in the requested delay. PHG said it plans to bring the matter back before the Planning Commission at its June 17, 2013, meeting. The planning staff recommended against the rezone and special use on the ground it “appears to conflict with the development goals and strategies” the county has established for the area. If the BOC, which has final authority, decides to grant the rezone, the staff listed nine conditions that it feels should be imposed on the rezone. All but the first condition are pretty standard. The Barber Creek Liftstation is on Mars Hill Road at the bridge over Barber Creek. The required line would run from that station along the northern side of Barber Creek back to the rear of the proposed site for the PHG facility. 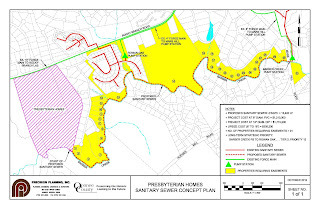 Sewage would then flow by gravity downstream to the Barber Creek Liftstation, where it would be pumped up to Mars Hill Road and then all the way back to the Land Application System site on Rocky Branch Road near the North Oconee High School. The LAS site is one of two sewage treatment facilities in the county. The other is on a tributary of Calls Creek outside Watkinsville. Chris Thomas, Utility Department director, told me today that the county rejected another option for getting the sewage to the LAS site because of its expense to the county in the future. That option involved a liftstation (pump) at the rear of the PHG site, an upgrade to an existing pump station in the Rowan Oak subdivision, and an upgrade to a third liftstation on Mars Hill Road. “Liftstations are expensive,” Thomas said. They require energy to operation as well as backup systems and frequent visits by staff, he said. Although the developer is required to pay the initial costs of building the liftstation, the county assumes the costs once they are in place. Because of the expense, Thomas said, the county is trying to move toward gravity fed lines as much as possible. The proposal includes the rough estimate of $1.2 million for the 8-inch line that would be required to service the PHG facility and a cost of $1.7 million for an 18-inch line that the county could require to be installed, with the difference born by the county. As part of its long-range plan, the county envisions a gravity-fed line all the way down Barber Creek to McNutt Creek and the Middle Oconee River, the proposed site of a future county sewage treatment plant. In 2008, PHG sought and received a rezone of 55 acres across from Gainesville State College off Experiment Station Road for a facility similar to the one being proposed now for Rocky Branch Road. Thomas told me that the site, which remains undeveloped, contains sewer lines. PHG President Frank McElroy informed Oconee County officials in early August that it was reviving its plans for its Presbyterian Village project, but not at the original site near Butler’s Crossing. 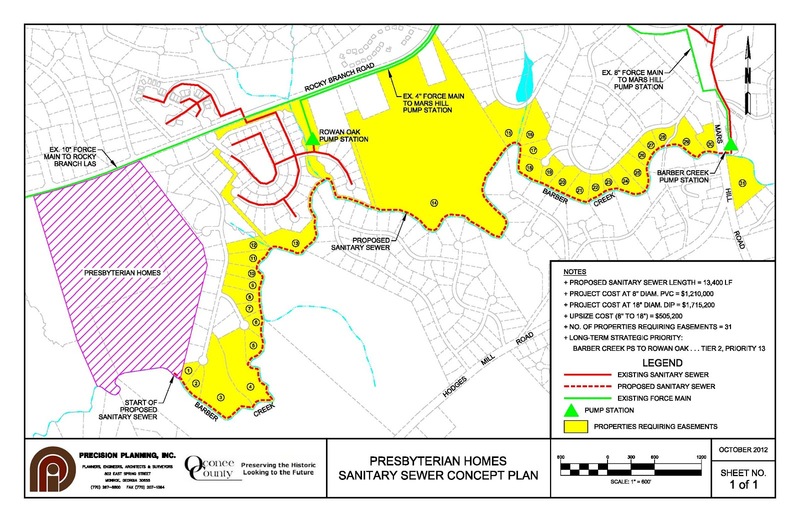 After considerable discussion involving the county attorney, Thomas and then county Administrative Officer Alan Theriault, Thomas on Aug. 31 wrote to Smith Planning Group, representing PHG, indicating that “water and sewer capacity in the amount of 62,906 gallons per day is available” for the new location of a Presbyterian Village. Thomas originally had said that the continuing care retirement community should be classified as a residential user and thus not eligible for sewage capacity under the current guidelines passed by the Board of Commissioners. County Attorney Daniel Haygood determined that continuing care retirement communities were to be treated as commercial users and thus eligible for access to the county’s sewage treatment system. PHG would need to be granted easements from at least 13 lot owners in Rowan Oak as well as from those living along the creek nearer to Mars Hill Road. Chris and Gene Mobley, who own one of the lots closest to the proposed PHG facility, have been leaders in the opposition to the rezone. The easement would be required to allow PHG to dig the ditch and then install the sewage pipe. The easement also would allow the county to maintain the pipe once it assumed ownership of it. Thomas told me he could imagine that some home owners would be willing to grant the easement as a way of getting access to county sewage treatment. Others, he acknowledge, might not be so enthusiastic about the disturbance to their property the construction would require. Thomas was not the one who told me that the sewer line played a role in the requested delay of action on the rezone by PHG.